SAN FRANCISCO (June 7, 2002): Douglas R. Young, a partner at Farella Braun + Martel, was presented with the Criminal Justice Achievement Award by the Criminal Trial Lawyers Association of Northern California. He received the award at the Installation and Judges Luncheon on Thursday, June 6th, 2002. 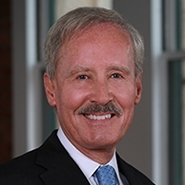 Mr. Young is a Fellow of both the American College of Trial Lawyers and the American Academy of Appellate Lawyers. Mr. Young is also past president of the San Francisco Bar Association and a Master of the McFetridge American Inn of Court. He is also a member and past president of the California Academy of Appellate Lawyers, and a member of the American Law Institute and the American Judicature Society. He formerly served as president of the Northern California Chapter of the Association of Business Trial Lawyers. He is listed in The Best Lawyers in America. Mr. Young's practice spans both civil and criminal law, intellectual property, securities, antitrust and regularly involves parallel criminal and civil proceedings. Mr. Young received his B.A. from Yale University and his J.D. from Boalt Hall School of Law.